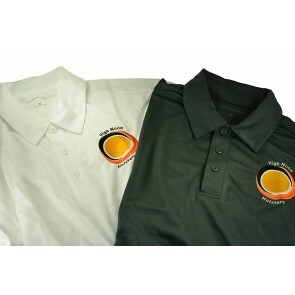 High Noon Performance Polo Shirts: Make a bold fashion statement with these attractive Silk Touch polo shirts that will look great on the golf course, at the shooting range, in the office or anywhere else. Available in white or steel gray, the shirts feature a 100 percent cationic double knit polyester material designed to wick perspiration and resist snagging. The three-button placket with dyed-to-match buttons provides an attractive finishing touch. The advanced PosiCharge technology ensures your shirt will retain its vibrant color and fantastic look. 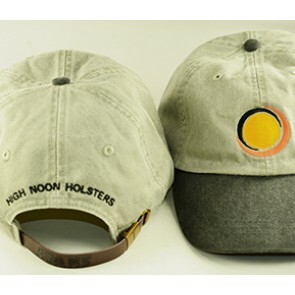 High Noon Caps: Our holsters clothing selection also includes attractive ball caps with the High Noon Holsters logo embroidered on the back. 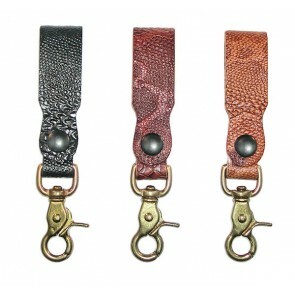 You'll look good while proclaiming your appreciation for the best holsters on the market. Our caps are crafted from long-lasting material that will hold up well, even after extended wear. The adjustable leather strap ensures the perfect hit. Color options include pink, beige and khaki, and you can also select two-tone color schemes of distressed gray with a black bill and distressed light green with a green bill. 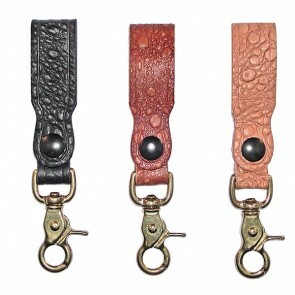 Embossed Key Chains: Replace your old, worn-out keychain with an eye-catching piece of "swag" from the High Noon Holsters clothing collection. 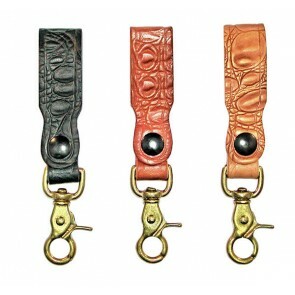 Choose from embossed chains in a Python, Ostrich, Alligator, Bull Frog, Crocodile or Shark design with color options of black, natural or tan. You can also select from brass or chrome for the hardware. 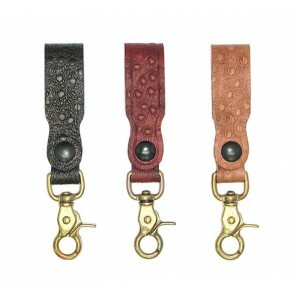 At High Noon Holsters, we believe ordering merchandise online shouldn't be a hassle. Our redesigned e-commerce website makes it simple to locate and order the perfect holsters clothing item. Just select the products you wish to purchase, add them to your shopping cart and complete the streamlined checkout process. We offer multiple payment options, including MasterCard, Visa, American Express, Discover and PayPal. You'll love our fast shipping, too — we can process most orders for in-stock items within one to five days! Since the founding of our company in 1997, High Noon Holsters has strived to achieve the goal of offering top-quality holsters and accessories backed by superior service. We've packed our site with loads of information regarding our products to help you make an informed purchasing decision. If you need further product selection assistance, you can contact us by phone or email, and we'll provide a timely response. If you're not happy with your purchase, we'll do whatever it takes to make things right. It's all part of our mission to deliver 100 percent customer satisfaction. Please take a few minutes to browse our extensive holster clothing inventory, and feel free to contact us if you have any questions. Make High Noon Holsters your one-stop headquarters for holsters, accessories and more!